The albacore tuna fishery of the pacific northwest is a special deal that provides anglers the opportunity to hook into these fast swimming hard fighting fish in good numbers all within the a reasonable distance for the sport fishing boats. The ports up and down the coast from Ilwaco across the boarder in Washington down to Southern Oregon are called home by the tuna fleet. Tuna begin to show up in very limited numbers near the end of June beginning of July and will be caught through the summer into the fall. Albacore can be caught in a variety of ways, most anglers will troll a combination of different lures such as cedar plugs, clones, diving baits like Rapala X-Raps, and swimbaits. After finding the fish on the troll, getting a bait stop going by chumming with anchovies can keep the school of fish close by that it is possible to then catch more fish on live bait, large iron baits similar to spoons, and casting lures like swimbaits. It is possible to get into large numbers of fish and catch many fish from a single stop and it is this lights out fishing that makes fishing for TUNA! so much fun. There are many excellent tuna fishing charters available for scheduling trips if you are looking for someone to teach you how to fish offshore. Keep tabs on how the fishing season is progressing by checking on the salty dogs forum. Learn more about catching these fish from anglers that have been fishing the salt for years. 2013 brings a new adjustment to the regulations regarding tuna fishing and how anglers can prepare their catch prior to landing. It is possible to partially cark the tuna in order to reduce some of the fish remains that need to be retained. Anglers with smaller boats with less space for holding fish catches will be able to gain room in their fish holds. If you plan on partially carking fish at sea make sure you read the full details here so you do not get in trouble with breaking the fishing regulations. Oregon anglers are getting another weekend of Halibut fishing that is open to all depths. Ports up and down the coast will be busy June 22 – 22 if the weather holds well and the seas are calm fisherman should have an excellent opportunity to catch a halibut and with the warming weather coming even possibly go a little further and catch an early summer albacore tuna. NEWPORT – Fishery managers added three more days to the popular all-depth sport halibut fishery off the central Oregon coast. Fishing for Pacific halibut will be open Thursday, June 20, Friday, June 21, and Saturday, June 22, at all depths. The spring all-depth season for the central coast area – from Cape Falcon (30 miles south of the Columbia River) to Humbug Mountain (south of Port Orford) – opened May 9 on Thursdays, Fridays and Saturdays. It could have closed as early as June 8 if anglers caught the entire 120,947-pound quota. “After the June 20-22 opening, fisheries managers will again look at the catch and see if there is enough quota remaining for additional back-up dates,” said Lynn Mattes, halibut project leader for ODFW. Subsequent decisions on open dates will be posted on the ODFW Marine Resources Program Web site at: www.dfw.state.or.us/MRP/ and sent out on the Halibut News Bulletin. To sign up go to http://dfw.state.or.us/MRP/bulletins/index.asp and enter your phone for text alerts and e-mail information to subscribe to email updates. Future dates will also be on the National Marine Fisheries Service hotline (1-800-662-9825). Potential dates for additional fishery openings include: July 4-6 and July 18-20, until the quota is met. The summer season for the central coast all-depth fishery opens Aug. 2 and is scheduled to be open every other Friday and Saturday until the combined spring and summer season all-depth quota of 168,942 pounds is taken or Oct. 26, whichever comes first. The daily bag limit for Pacific halibut is one fish and there is no minimum length requirement. The possession limit is one daily limit at sea and three daily limits on land. The annual limit per angler is six fish. Sport anglers are reminded that possession of groundfish is not allowed north of Humbug Mountain when a Pacific halibut is aboard their vessel during all-depth Pacific halibut dates. The exceptions are Pacific cod (true cod, not lingcod) and sablefish (black cod) which may be retained with halibut between Humbug Mountain and Cape Falcon. Other non-groundfish species (such as tuna and salmon) may be possessed with halibut on open all-depth Pacific halibut days (as long as such species are taken during authorized seasons and caught with legal gear). More details on regulations can be found at: http://www.dfw.state.or.us/MRP/finfish/halibut/index.asp or in the booklet 2013 Oregon Sport Ocean Regulations for Salmon, Halibut and other Marine Species. General regulations can be found in the 2013 Oregon Sport Fishing Regulations booklet. Fishing for albacore tuna off the Oregon coast is an awesome Oregon adventure, depending on the year the season varies but generally between the late spring to early fall is when Albacore tuna can be caught within a couple hours off shore. There are many certified charter guidess that pursue these pelagic fish that you can fish with and they run out of all the major harbors from the Columbia River, Garibaldi, Depoe Bay, Newport, and Charleston. If you have your own boat that is ocean worthy then all you need are a few tuna fishing lures and boat full gas and ice and you can run off shore and get into these tasty fish as well. Most anglers will do a combination of trolling and bait stops in order to plug the boat with tuna. These fish make the reels scream as they bite the lures and make big hard runs and fight like no other fish found off the coast of Oregon. If you have only experienced salmon or halibut fishing offshore in the Pacific Ocean then you are in for a treat as even a small albacore can wear your arms out in a hurry. Check out some fish catching action. Here are a few of the well known Tuna charters and individual guides that are available by the various ports. They do it all from salmon fishing to bottom fish for sea bass to halibut and of course TUNA! JB charters two boats one for salmon fishing and another larger 35′ boat fully equipped for deep halibut and Tuna fishing. 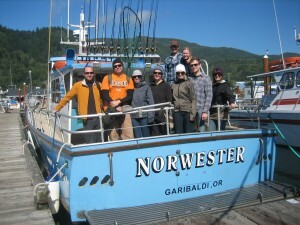 Garibaldi Charters – is a long standing charter operation out of the Port of Garibaldi that provides a party boat experience for Tuna fishing. If you and a dozen friends want to have a great time together this is a great outfit to go with. Tradewinds Charters has a large fleet of different vessels including boats that are fully equipped for Tuna fishing. Regardless of the type of fishing you are looking to experience on the Central oregon Coast Tradewinds charters has a boat, skipper, and crew ready to get you out on the water for a good time. Nalu Charters is another excellent option from this port. If you own your own sport fishing vessel that is ocean ready, but you have never experienced Tuna fishing before Nalu Charters may be the right option as you will get the experience of fishing for Tuna from a 4 pack boat versus some of the larger vessels which sometimes fish over a dozen people, learn the techniques that you will need to get out on the big pond by yourself and catch fish. Yaquina Bay Charters – keeps a very active blog with available trips and activities and is worth checking out if you are looking for awesome salmon, bottom fish, or tuna action leaving out of Newport. Betty Kay Charters based out of Charleston runs a 12 hour Tuna trip in season at only $190.00 per person which is very reasonable for a Tuna fishing experience. Hope you get the chance to get out there and catch some of these awesome hard fighting and delicious fish. Fresh tuna medallions on the grill and fresh canned tuna is phenomenal. Albacore tuna is also rated as a sustainable fishery and can be harvested in large numbers off the Oregon coast by sports anglers without having any effect on the population of fish that make the Oregon coast there home during the summer months. The Oregon Coast is very beautiful with the Pacific providing us with the work of its labor: sandy beaches, intriguing rock formations, and delicious fish, shellfish and plants. The Pacific holds many mysteries, beneath its surface is a world so different it almost seems like another planet. The National Oceanic and Atmospheric Administration (NOAA) works to solve these mysteries, and the people of Oregon appreciate them. The groundbreaking ceremony for NOAA was on June 3, 2010, just a little over of a year later the world class facility was dedicated on August 20, 2011 in Newport. It is the home port of four scientific ships that conduct oceanographic research, fisheries surveys, and sea floor mapping operations. These studies help scientists to better understand and protect marine mammals, coral reefs and historic shipwrecks, managing commercial marine fish stocks. The work performed regarding climate processes, and nautical charts help keep mariners safe. August 10th , the Port and city of Newport will celebrate the one year anniversary of having NOAA in Newport. Festivities begin at 4:30 pm at Port Dock 7 with a picnic barbeque hosted by the Greater Newport Chamber of Commerce. Hamburgers and hot dogs will be cooked by Don Mann, Port General Manager, and friends and the meal will be completed with side dishes and Pepsi products or water. At 5:30 pm during a special ceremony, officials from the Port of Newport, Chamber of Commerce, and other local notables will present a cake to NOAA. Cost for the picnic is $5. On Saturday, the action starts at 10 am with members of the Northwest Woodies Club will be there with their ‘surfer’ cars. You cannot help admiring these unique cars. The Bay City Cruisers will also participate with some of their antique and classic cars. You can enjoy these wonderful cars and reminisce about the past. The cars will be available for drooling over until 4 pm. At eleven o’clock, the serious fun begins as teams of chefs compete in the Great Albacore Tuna BBQ Challenge for $2,000 in prizes. You can watch the teams work to produce their tantalizing entries. The Awards Ceremony will be at 3:30 pm. All you can eat samples are $10 for adults and $5 for children 6 through 15 years of age, if purchased in advance on line at www.yaquinabaybbq.com. Tickets purchased at the event will be $12. Sponsors include Chinook Winds Casino and Resort, Oregon Albacore Commission, News Times, among others. Mak Grills, Burning’ Love BBQ, 3 Sisters Kettle Corn, Newport Food Pantry Pepsi Stand and other vendors will be on hand to supplement the tuna. Having NOAA come to Newport gives the citizens here a great deal to celebrate. Come and join the party! Celebrate NOAA and all that the beautiful Pacific Ocean gives Oregon. If you are looking for a great local guide in Garibaldi Oregon to fish the bay or ocean than you need to give Johnny Bowles a call and see if there is availability during the time you are looking to go fishing. I had the pleasure of fishing with him for Spring Chinook this past spring and it was an excellent day on the water. He makes the day fun and will teach you a lot about how to catch fish from this awesome fishery. We started off by tossing a few crab pots in the ocean and then got to fishing, using herring to target Spring Chinook salmon. The fishing was a little tough the day I went, but we did still get into a few fish and I lucked out with one of the biters landing on my rod, which resulted in a nice Spring chinook. He worked hard all day to give us the best opportunities to catch fish as possible, which is what you want in a guide, one that doesn’t give up and start just going through the motions when it is a tough day. Johnny fishes for salmon in the bay and ocean and also does halibut, bottom fish, and tuna trips depending on the seasons, his website also states he fishes some of the local coastal rivers for salmon and steelhead. He runs a beautiful Proline boat that can accommodate several people and takes the bar crossings well. 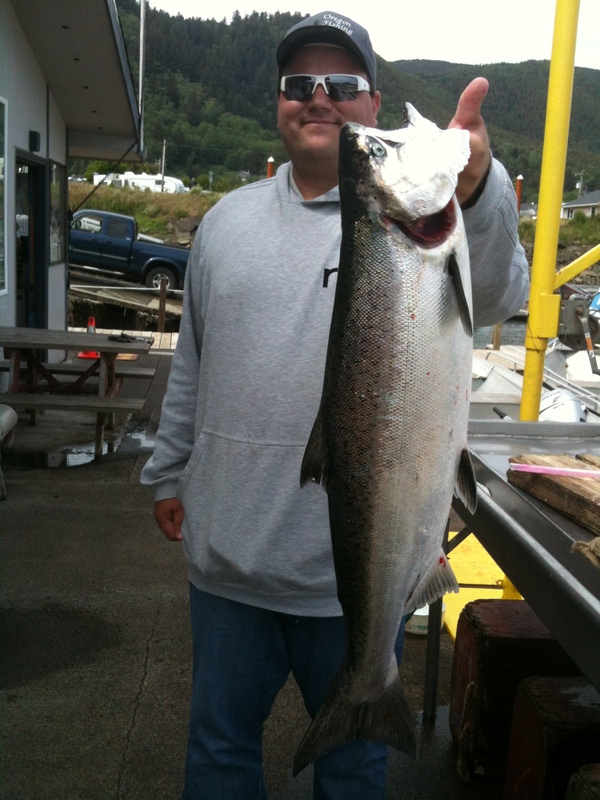 Tillamook bay is a wonderful fishery and with the Pacific ocean close by the options are pretty wide open for anglers looking to have a good time any time of the year and JB is defiantly one of the guys that has this place dialed. I look forward to getting out and fishing with him again in the future. Here is a video of Johnny in action fishing the Pacific Ocean and Tillamook Bay out of Garibaldi marina. 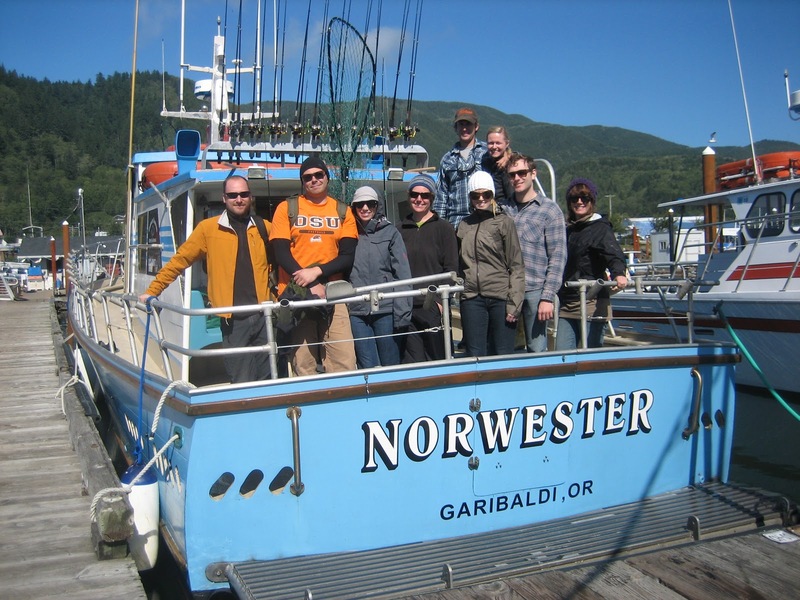 If you are looking for a charter guide service for ocean fishing or sight seeing along the Oregon coast out of the port of Garibaldi then you should give the folks at Garibaldi Charters a call. They run a couple of really nice large charter boats the D&D and the Norwester, both captained by skilled Coast Guard approved skippers and deckhands with extensive local knowledge and fish catching skills. These charter boats are large and make even large seas comfortable to fish in, so they are perfect options for a first time ocean fishing adventure or taking the kids out for a new fishing experience. Garibaldi Charters specializes in fishing trips for bottom fish which include Ling Cod, Rock Bass, and several other species that live on the rocky bottoms near shore and off shore on the deep reefs when the season permits fishing the deeper waters. They also conduct Halibut, Salmon, and Tuna charter trips depending on the season, so call to see what types of fishing adventures will be available when you are thinking of fishing. Other activities such as whale watching and scenic excursions are also available from this outfit at certain times during the year, so if catching fish is not your thing, but you still want to get out on the Oregon ocean there is activities you can enjoy with Garibaldi Charters. Make sure to bring your lunch, rain gear, and a camera and be ready to have a good time fishing the bountiful Oregon ocean.